So what are you buying into exactly? Adam grew up in an era when reasonably priced tailors were plentiful in London, most often Jewish immigrants, and any man worth his salt had one. 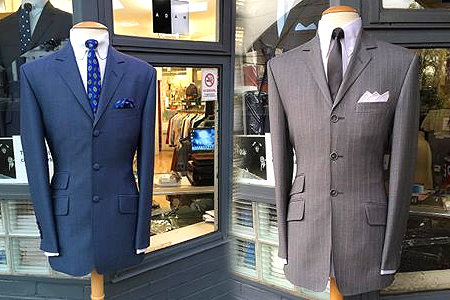 Adam takes this train of thought into his collection, although all suits are off-the-rack, Adam and the boys (if required) provide all the necessary nips, tucks and alterations to have you walking away with an off the peg suit that fits like bespoke, with its hand finished stitching and sharp edges. 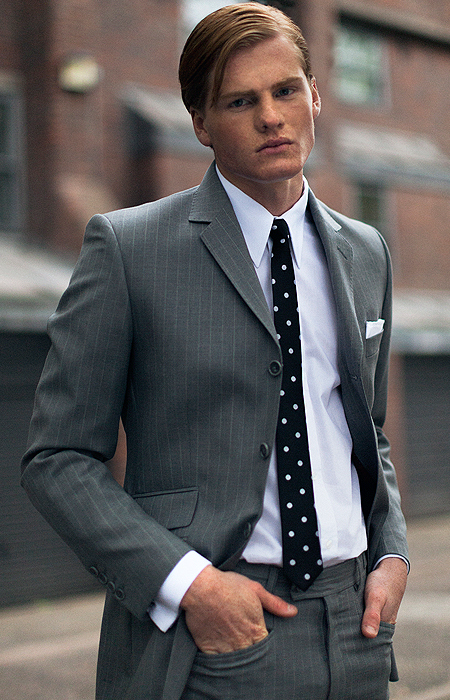 Aside from a few seasonal tweaks the style of suit remains the same; three buttons on the front; four buttons on the cuff and working button holes; narrow lapels (6cm); suppression on the waist of the jacket; long side vents; slightly slanted jacket pockets with flaps, plus a ticket pocket; hand stitched edges; good quality coloured lining; straight legged trousers without pleats; side adjusters on the waistband and front pockets. 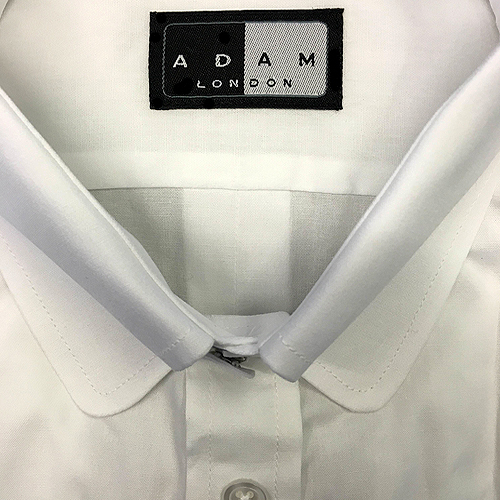 Adam also offers a small range of two button suits with the same specifications, however, this range is due to expand in the coming months. We at Adam of London hate the notion that you have to be 6ft with a 38-inch chest and a 32-inch waist to look good in a suit. We provide suits for gentlemen from all walks of life, whether short, tall, fat or thin, our sizes range from 34 short to 48 long. We at Adam only use British cloth sourced from English mills, most of which have been made up and crossed specifically for us in order to achieve our exclusive mohair colours and tonics. We believe English cloth to be the best in the world. As to the range, we offer pure wool, kid mohair and wool (Tonic) and a small selection of wool/mohair and polyester blends. You can’t have too much of a good thing! To complete the look we stock a large range of shirts, they come in plain colours, stripes and various patterns and a variety of collar styles e.g. tab, button down, long point, pin-through and penny round pin-through, all 100% cotton. 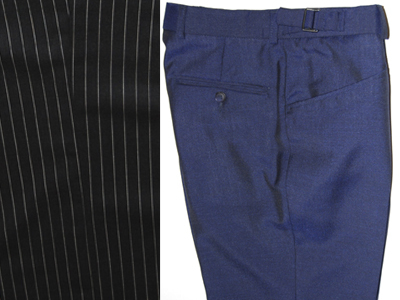 In terms of the fit, we classify them as tailored as opposed to slim with darts and a box pleat at the back. We also have our own range of silk and knitted ties most of which are available with a matching pocket square and scarf. These come in a wide range of patterns including paisley, polka dots, and stripes. As a final touch we also provide a range of splendid overcoats in pure wool, incorporating classic 60’s features; 4 buttons, ticket pocket, long center vent all with velvet collars and coloured linings, these are available in a range of colours and patterns e.g. black, charcoal, navy etc. We are constantly working on new designs at Adam of London and last year we brought into play a Classic P-Coat with football leather buttons and also the long awaited Car Coat with standard convertible collar and finishing just above the knee for those seeking a more casual look to the overcoat; these are also available in a small range of Herringbone patterns.